games. When deciding whether the Kinec consider that the Wii has been around the longest and will have more games of all types specifically for the Wii. If you already own a Nintendo Gamecube you can still use its controllers and games with the Wii. It's a great perk if you have and love a lot of Gamecube games. Kids of all ages and adults love the Wii with classic Nintendo characters such as Mario, Peach and Donkey Kong. The games involving these characters are fun and challenging, yet lack the blood and gore of many other popular games today. As of October 2011, you can purchase a Wii Console Bundle at Amazon for $160.85. 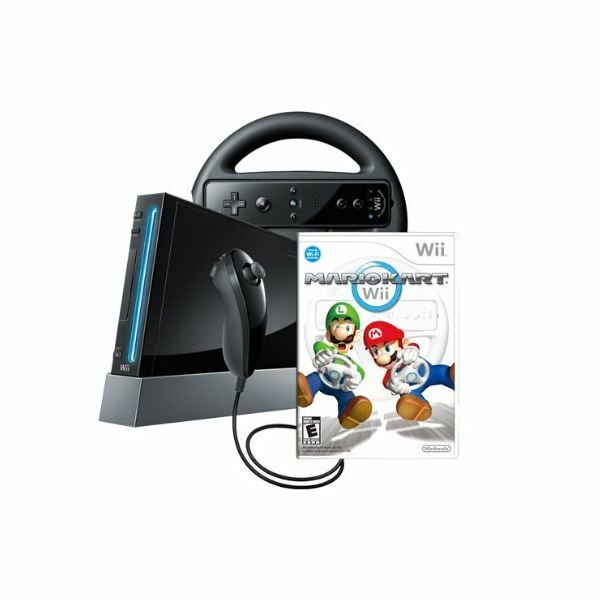 Your bundle includes: Wii console, Wii Remote Plus Controller, Wii Wheel, Nunchuk controller, Sensor Bar, Wii Mario Kart, standard composite cable and power cord. The Wii is a great option for families that have a tight budget because it is cheaper than the other newer gaming systems. Wii Remote Plus Controllers combine the original motion controls of the Wii with the "precision technology" of the Wii MotionPlus. These controllers have a speaker, rumble feature, and an external connection for other devices such as the Nunchuk and classic controllers. All consoles connect to the internet and have access to a large number of classic and new games via the Wii Shop Channel, where you can select online games that can be played with friends on the Wii. Your family will love creating cartoonish Mii characters to represent themselves and others and use them in games such as Wii Sports. You can also download Miis created by other Wii owners if you like their Mii versions. You can now watch movies and TV episodes utilizing your Wii console and a Netflix membership. You must have a Netflix Instant Streaming Disc for the Wii and a broadband Internet connection to be able to use this option. For parents who are worried about children having access to games that they feel are not appropriate for their children, the Wii is equipped with parental controls. The parental controls allow parents to: manage access to Wii game software according to ESRB ratings, restrict access to certain channels, limit the ability of their children to receive and send messages and ban the use of Wii Points in the Wii Shop Channel. If you are looking for party games that your whole family can play together, the Wii has many games that fit the bill. There are currently eight and soon to be nine "Mario Party" games that are filled with fun for everyone. In these games you get to use Mario, Donkey Kong and other adorable characters to play a variety of games with. Some other party games include: Wii Party, Game Party, Carnival Games and Hasbro Family Game NIght. A new release game typically costs around $50, with older games costing less. No matter what type of game your family likes to play, the Nintendo Wii will not disappoint. Blu-ray gaming and movies that are playable in high-definition are available thanks to Playstation Network's bi Wi-Fi Internet browser and hard drive. The 320 GB hard drive has HDMI (High-Definition Multimedia Interface) which delivers digital pictures and sound that is compatible with high-definition TV's and projectors. experience. The Move motion controller has a glowing sphere at the end of it which changes colors depending on the game you are playing and the activities in the games.The color changing sphere is not only mesmerizing but allows the Eye camera to track every movement and position in the room. When deciding whether Kinect, Wii or Move is right for your family, cost is an important factor. Of the three gaming systems, this one is the most expensive. A Playstation 3 320 GB System Bundle is available at Playstation for $349.00 currently. The purchase includes: PS 3 320 GB system, DualShock 3 wireless controller, PS Move motion controller (wireless), PS Eye camera, Sports Champions Blu-ray game, PS Move game demos disc and AC power cord. In order to use the Move there are three parts that are necessary: a PlayStation 3 console, an Eye camera and a Move motion controller. These items can be purchased separately, and it is a less expensive option if you already own a PlayStation 3. Though playing Playstation 2 games is an option on some Playstation 3 models, it is not an option with the 320 GB model. The Playstation 3 Move was launched in September 2010 so it is a relatively new system. The actual PS 3 320 GB bundle on Amazon is rated "Everyone 10+" which means that the system is more appropriate for children who are at least 10 years of age. Yet there are games such as EyePet that smaller children would enjoy playing. There are definitely fewer family-friendly games for the PS 3 Move than for the Wii. PS 3 Move games have icons at the top of the package indicating exactly what components are necessary for or compatible with the game. Compatible components merely enhance the gaming experience while required components are needed to play the game. A new release PlayStation 3 Move game usually costs approximately $40. Immersing yourself in games without a controller is part of the XBox 360 Kinect experience. The newest of the three gaming systems is also the most unique. 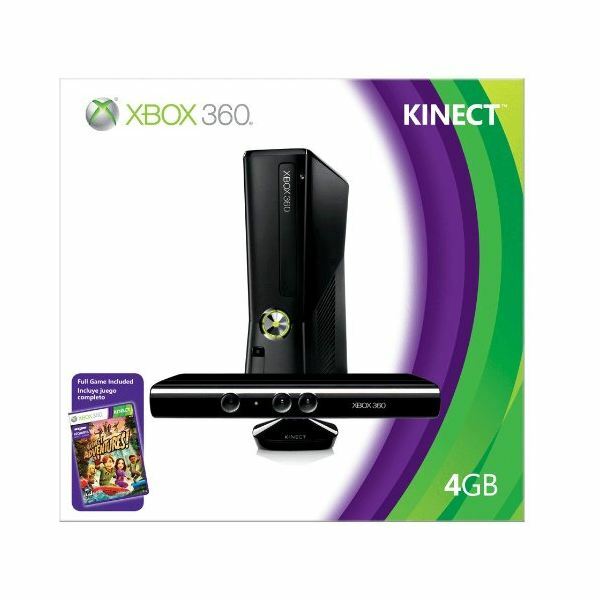 Launched in November 2010, the Kinect is the only system that does not require a controller for play. The Kinect sensor is the key to this gaming experience. It uses full body tracking to place you in the games.The sensor recognizes your body and mirrors your movements as you become the controller. The XBox 360 4GB Kinect Bundle can currently be purchased at Amazon for $299.99. The purchase includes:XBox 360 4GB console, Kinect sensor, built-in WI-Fi, XBox Live, XBox 360 wireless controller and Kinect Adventures game. The Adventures game is great for the whole family. It is rated "Everyone" and allows you to do things such as float in outer space and go underwater to explore a leaky observatory. The best selling Kinect game is Kinect Sports which is rated "Everyone 10+." You can choose from soccer, beach volleyball, boxing, track and field, table tennis or bowling. In beach volleyball, for example, you actually jump up when you spike a ball just as you do in real life. It's incredible! There are more family-friendly games for the Kinect than for the Move. Kinectimals is a great game for the Kinect that won the Parent's Choice Gold Award. A newly released game such as "Sesame Street: Once Upon a Monster" costs approximately $50 on Amazon. Older games can be often purchased for less money. Images and product information courtesy of Amazon.